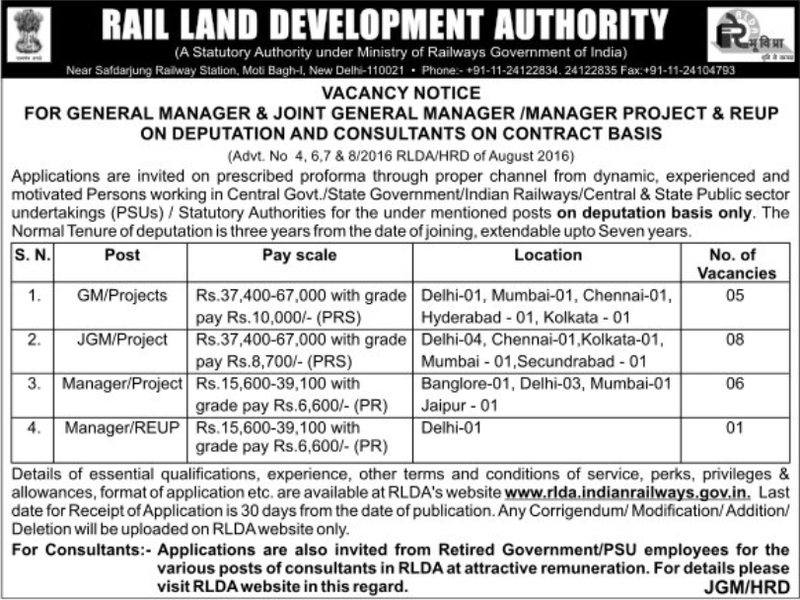 Rail Land Development Authority (RLDA), New Delhi is going to recruit application for the experienced Persons working in Central Govt./State Government/Indian Railways/Central & State Public sector undertakings (PSUs) / Statutory Authorities for the following positions on Deputation Basis Post. The candidates may apply till 16th September 2016. RLDA is a statutory Authority under the Ministry of Railways, Government of India, set-up by an Amendment to the Indian Railways Act, 1989, for development of vacant railway land for commercial use for the purpose of generating revenue by non-tariff measures. The RLDA (Constitution) Rules, 2007, were laid down on 4 January 2007. 1. GM/Projects : For 05 Posts. 2. JGM/Project : For 08 Posts. 3. Manager/Project : For 06 Posts. 4. Manager/REUP : For 01 Post. The eligible intrested candidate can apply on the last date for Receipt of Application is 30 days from the date of publication dated 16th September 2016.